These clocks will have 3 chains, one for each weight. The weight on the right powers the Westminster melody. The one in the middle runs the time and the one on the left powers the hour strike and count. Over the course of a week, the weights will be dropping as they power the clock. At the end of a week the weights will be near the bottom and need to be returned to the top so they may do their work again for another week. Each chain has two ends, one where the weight is hung and the chain goes up into the clock around a sprocket and back down where it may be pulled down to bring the other side with the weight back up again. 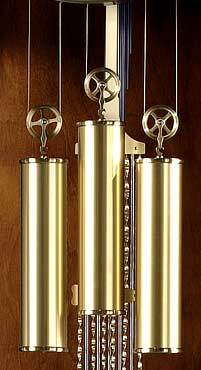 These chain driven clocks cost less to manufacturer and are usually found on entry level grandfather clocks. It is best to use a glove or cloth when pulling the chains down once a week to raise the weights so the brass on the chains will not tarnish with time and detract from the clock. These clocks will have 3 cables, one for each weight. The weight on the right powers the Westminster melody. The one in the middle runs the time and the one on the left powers the hour strike and count. Over the course of a week, the weights will be dropping as they power the clock. At the end of a week the weights will be near the bottom and need to be returned to the top so they may do their work again for another week. The advantage over the chain driven movements. You insert a key into the dial and wind the weights up once a week. Your hands never touch the brass and no chains to tarnish.